When hotel brand, Kimpton, opened its Seafire Resort & Spa on the shores of Grand Cayman’s famed Seven Mile Beach in November 2016, it marked the start of a chain reaction of revitalization and development projects across the island. Over the next few years, the Cayman Islands will see the completion of several projects, including a complete renovation project at The Westin Grand Cayman Seven Mile Beach Resort & Spa, the expansion of retail, residential, and business hub, Camana Bay, and a multi-million dollar expansion project of the Owen Roberts International Airport (ORIA). It’s an exciting time for the Cayman Islands as the nation begins to redefine the expectations of a typical Caribbean vacation. The 266-room Kimpton Seafire Resort & Spa that started it all is the Cayman Islands’ first new resort to open since the Ritz-Carlton ten years prior. While it boasts every amenity expected of a luxury property – private bungalows, multi-level pool deck, full-service spa, beach bar, incredible restaurants, and more – it was the Kimpton brand that offered Cayman developers a unique culture they hadn’t quite seen on the island before. And, while the colourful, contemporary, inviting décor is a true revelation in hotel interiors, it really is the service that is setting a new standard in modern luxury across the island. Each night, the hotel hosts a social hour in the lobby where Andre himself pours complimentary wine for his guests, while chatting about their stay. At the main doors, guests are greeted by the impeccably uniformed and impossibly welcoming porters. And nightly turn-down service includes sweet meringues, bottled water, and a personal note earnestly inviting guests to return. Cayman’s other brand name resorts aren’t too far behind. 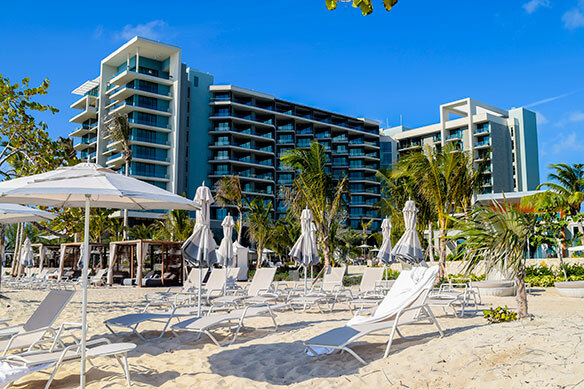 The Westin Grand Cayman Seven Mile Beach Resort & Spa just completed phase one of a $50-million top-to-bottom transformation worthy of one of the world’s best beaches. 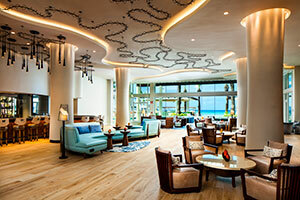 A fresh, nautical-inspired aesthetic dresses the inviting lobby and all common spaces. Phase two of the project began in late April and will see the refurbishment of the resort’s 343 guest rooms and suites completed by August 2017. Beyond the hotels and resorts, there’s more happening downtown. 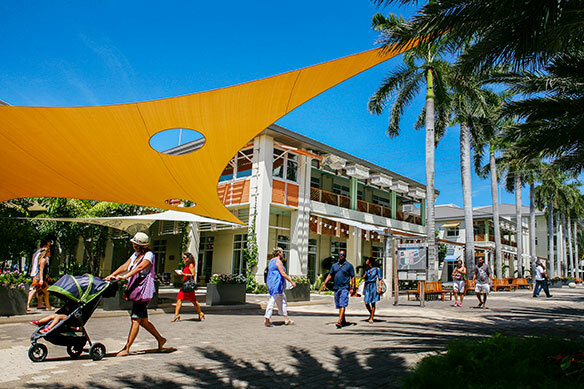 Camana Bay, the business centre of the Cayman Islands and the Caribbean’s only true mixed-use master planned community, is a lively waterfront hub of shops, entertainment, cafés, bars, restaurants, commercial offices, and residential properties. Construction of One Nexus Way, 86,000 square feet of office, retail and restaurant space located in the town centre, is due for completion this year. “Our vision is for Camana Bay to grow organically, adapting to the economic, environmental and social interests of the island,” says Jackie Doak, president, Dart Real Estate. Construction is also currently underway on the island’s only overpass on West Bay Road, which will connect the current Camana Bay community based along The Crescent promenade, to the future of Camana Bay which will stretch across the width of the island to the sands of Seven Mile Beach. Details are sparse as complete infrastructure details have yet to be fully finalized, but excitement is growing. Other future plans for Camana Bay include single-family homes and more condos for sale. The Cayman Islands Airports Authority (CIAA) also has ambitious plans that will almost triple the size of the current Owen Roberts International Airport (ORIA) from 77,111 square feet to 208,800 square feet by the end of 2018. The five-phase renovation and expansion project includes 40 check-in counters, 17 retail concessions, nine gates, five baggage carousels, state-of-the-art airport security and technology systems, new duty-free mall, children’s play area, VIP lounge, and restaurant on the second level, plus the refurbishment of the original structure with two iconic arches. Currently, ORIA processes approximately 1 million passengers annually. Upon completion, ORIA will be able to easily accommodate up to 2.5 million passengers per year. More good news is that the local economy is already seeing impacts of the expansion project through construction and planning jobs. And even more job creation is expected as the project continues with airport operations, commercial, and administration opportunities. In tandem with these new developments, the Cayman Islands is initiating a multi-faceted marketing strategy for 2017 and beyond featuring a number of partnerships and promotions aimed at maintaining interest from repeat visitors, but also reaching new audiences and markets. For example, right now the destination is promoting their Summer Only in Cayman campaign aimed at Canadians, which offers savings of up to 45% off on accommodations, attractions, dining, and more. “Through these concerted efforts to amplify awareness of our new destination, we remain confident that we’re paving the way for long-term growth and success out of the Cayman Islands’ tourism sector,” explained Mathias. On the island, the sense of substantial change on the way can already be felt, and no doubt, the final results will be stunning. When probed about more things to come, officials hinted at the possible rejuvenation of downtown George Town, a popular port of call on cruise itineraries, another new luxury resort from a not-yet-announced world-class brand, and a burgeoning destination weddings business. It’s all part of the exciting things happening in the Cayman Islands, as it continues to redefine the Caribbean experience.